My daughter and I were in Target last weekend browsing the cosmetics when we came across a dress… hanging off a shelf of mascara and eye shadow. Now what is that about? Someone had decided she didn’t want the dress and just left it there, not six feet away from its proper display. I lifted the dress and hanger and hung it on the rack with the other dresses. It took all of two seconds. Simple, painless, but helpful. Which made me think. There are many ways we can all help out that are just as easy and quick. Here are a few. Hold open a door for someone at a store, building or car. 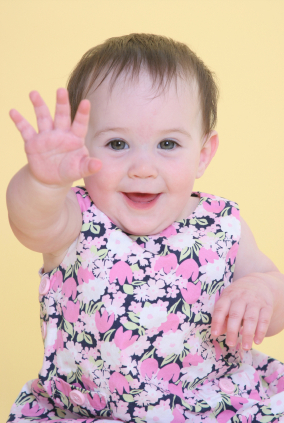 Wave at a baby and watch for the wonderful, innocent smile in return. Reach an item on a high shelf for someone my size. Shake hands when you greet someone (and make sure your handshake is firm — no dead fish or fingertips-only). If you see a book out of order in the library, put it back where it belongs so others can find it. Pick up a dropped book, papers, pencil, etc. Offer a compliment or provide a word of encouragement. Pick a piece of lint or stray cat hair off your friend’s jacket (be careful grooming people you don’t know well –they could consider it creepy). Tell your friend if she has lipstick on her teeth, a stray piece of salad in her smile, or toilet paper stuck to her shoe; after her embarrasment passes, she will be truly grateful. Bite your tongue; sometimes it’s better to leave something unsaid if the words will not help a situation. Throw your dirty clothes and towels in the clothes hamper (it takes just a second, but those with whom you live will appreciate it). Men, put the toilet seat down (and everyone else, close the lid; it will help avoid things accidentally falling into the toilet…like cell phones, but that’s a blog for another day). Wipe up spilled water around the sink. Pet your dog or cat; it will make both of you happy. Put dishes straight into dishwasher; don’t leave them in the sink. Lock your doors and windows at night. Turn down your mp3 player a notch or two; it can save your hearing. Stop to admire something beautiful or listen to a bird sing. Take a deep breath. Cleansing. Relaxing. Recharge. Clear your head. Put on sunglasses on a bright day; protect your eyes from the UV rays. Read and compare food labels. It can help your waistline and your wallet. Put on your helmet when biking, motorcycling or scootering. Turn off lights as you leave a room. Do the right thing. It might only take a second but it could save the world or change someone’s life for the better. Two seconds or less. Give it a try. « Have your cake and eat it, too.